The Matrox Monarch HDX dual-channel H.264 encoding appliance, featuring 3G-SDI and HDMI inputs with frame synchronization to compensate for unstable sources, is now available through its worldwide network of authorized dealers. The Monarch HDX is designed for use by broadcasters, event producers, medical facilities, CDNs, educational institutions, houses of worship, corporate communicators, and legal videographers. From any SDI or HDMI input source such as a camera or switcher, the Matrox Monarch HDX generates two H.264-encoded video streams at bitrates from 200 Kbps to 30 Mbps with scaling, deinterlacing, and noise-reduction engines. For streaming purposes, the encoders use either RTMP or RTSP protocol to deliver live streams to local media servers or cloud-based CDNs. In recording applications, the encoders write MP4 or MOV files to local USB drives, SD cards, or network-mapped drives for post-event editing or archiving. An additional, dedicated H.264 encoder provides remote preview of the input. 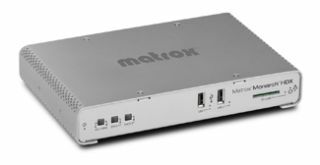 "The eagerly awaited Monarch HDX features two encoders in a single device so it can tackle any job — streaming to two different locations, recording proxy-quality and mastering-quality files simultaneously, or streaming while recording a higher quality version for VOD download," said Dan Maloney, technical marketing manager at Matrox Video. "It can integrate seamlessly into virtually any SD and HD installation to deliver video content for live or file-based workflows." It will be featured in live streaming and recording demonstrations at Campus Technology 2015 (Boston, Mass., July 27-30, booth 531), BIRTV2015 (Beijing, Aug. 26-29, booth 1B106), and IBC2015 (Amsterdam, Sept. 11-15, stand 7.B29).